Building a place of learning for the seekers of the humane aspects of economics. 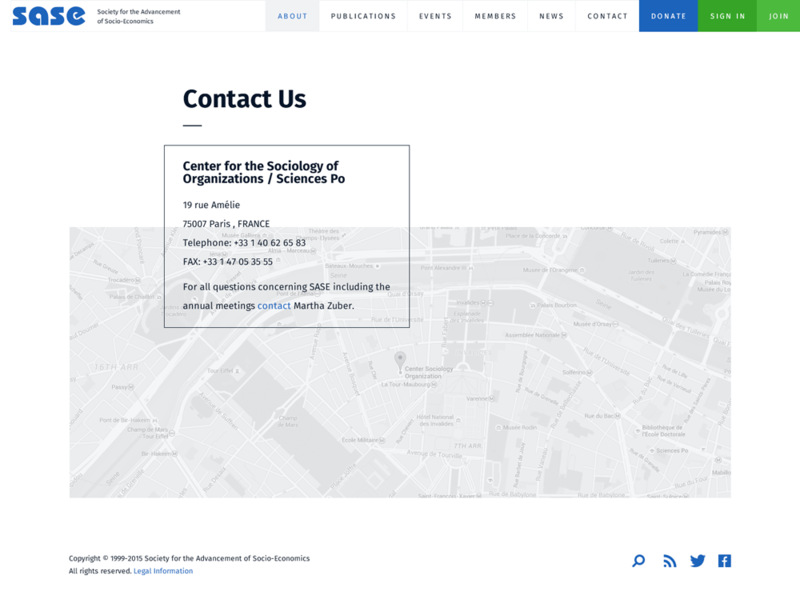 I was tasked to create a new online presence for the influential international organization, and replace its old unwieldy website. Founded back in 1989 by Amitai Etzioni, who is named one of the top 100 American intellectuals, and who developed the socioeconomics as a field of science, the Society for the Advancement of Socio-Economics is a complex organization with thousands of members. 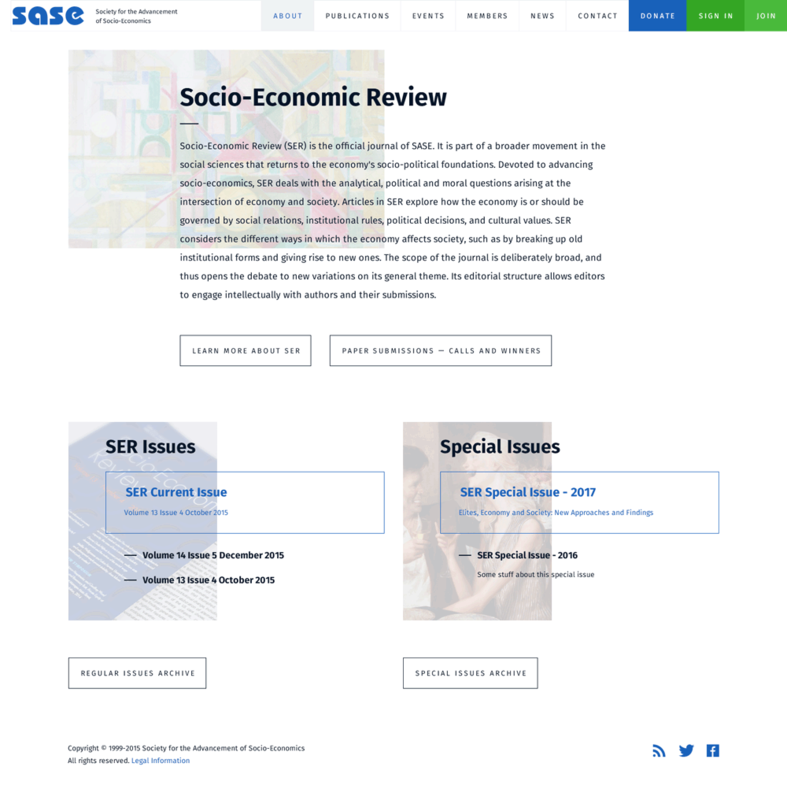 SASE also publishes one of the most important journals in the fields of sociology, economics, and political sciences — Socio-Economic Review issued quarterly by Oxford Journals. Old website's handling of the complex system of memberships, journal editions, and subscriptions was a pain to work with, had all kind of issues that could only plague a decade old resource, and there was no other way but to rebuild it from scratch. I had to create a new information architecture for the project, develop visual language, design simpler user experience, and make sure that even small number of untrained people could make necessary adjustments to the existing content, and create new one. First of all I had to structure existing content to create a logical and easy-to-follow flow of use for the site. The site was large in terms of content, perhaps one of the largest I have ever worked on aside from e-commerce projects. Most of it wasn't categorized so that's something that had to be done. Also a lot of content was only available for members of the Society and there were a lot of different membership levels... well, you get the idea. Categorizing content and developing site structure was only part of the problem I had to solve even before starting the actual visual design and user experience processes. Aside from the static information the amount of ever-changing little snippets of data here and there throughout the site was challenging. At the basic level there were several components that had to be created and edited by the inner staff of the organization. These components were then reused in the different places of the site to allow for modular content delivery. First of all the heart of the organization is its people. I had to come up with a way of storing and displaying information from people's profiles when necessary. The centralized database for people was set up: names, occupation, links, bios, you name it, were to be filled in by content managers and pulled when necessary in various interface elements. 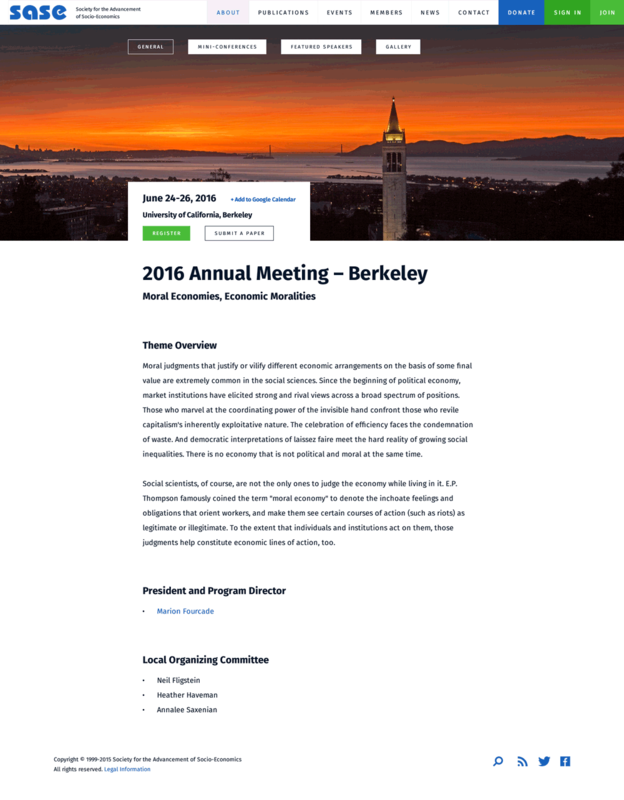 Second, the most important activities for the SASE are its annual conferences and events. I designed an event creation interface with abilities to publish basic info for visitors, posting photos of the past events, inserting speakers profiles etc. A few other elements that had to be used in a modular fashion were news, publications from organization members, and research networks to name a few. I also had to architect and design a user-flow for new members signing up. 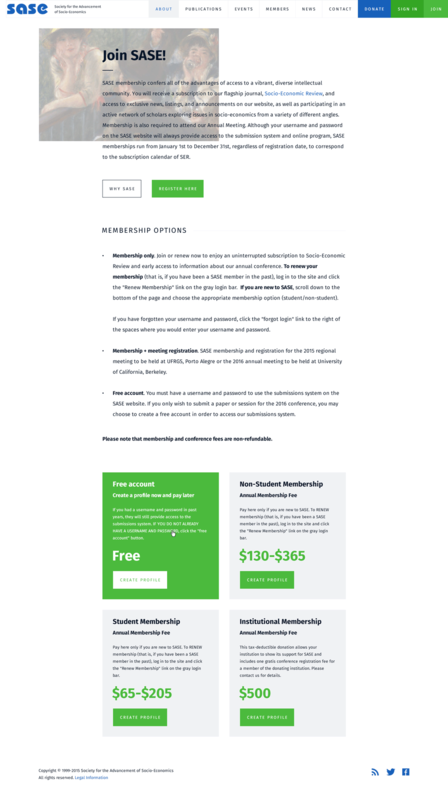 The final membership costs depend on many factors which are taken into consideration during the registration process so it had a wide branching choice structure. While considering the overall style several directions were initially explored, some bolder, some more conservative. Several versions were rejected for being a bit too casual. But even though overall more conservative approach was chosen, the final iteration was created based on an amalgamation of all the ideas developed initially. To keep things simple only a few colours and their shades were used. Most of the screen was always white, easy for reading, creating comfortable, and familiar academic experience. 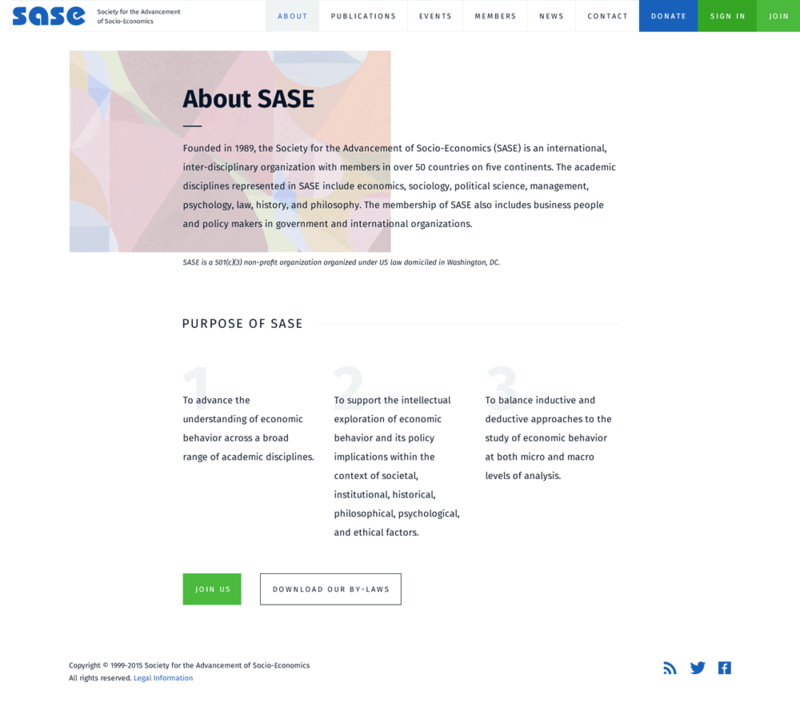 Light grey colour was used where any kind of low key elements separation was required, blue for most generic interactive elements, and green for anything that involved SASE membership and inner workings (like research networks). The initial direction was to make use of the impressionist paintings for the complimentary imagery, and I had a ton of fun finding paintings such as to be relevant to, say, "Hot Off the Press" page or "Socio-Econimic Review — Online Access" part. The idea had to be abandoned in the end since too much work was required of future content managers to do this all the time a new image was required. The images to replace impressionistic ones were decided to be abstract geometric painting of neoplasticisms and the like. Dozens of pages with research content, guidelines for paper submissions, and publications summaries were created with the main requirement of being highly readable. Other parts of the site were created to ease the hurdles of registrations, papers submissions, events management, and more. 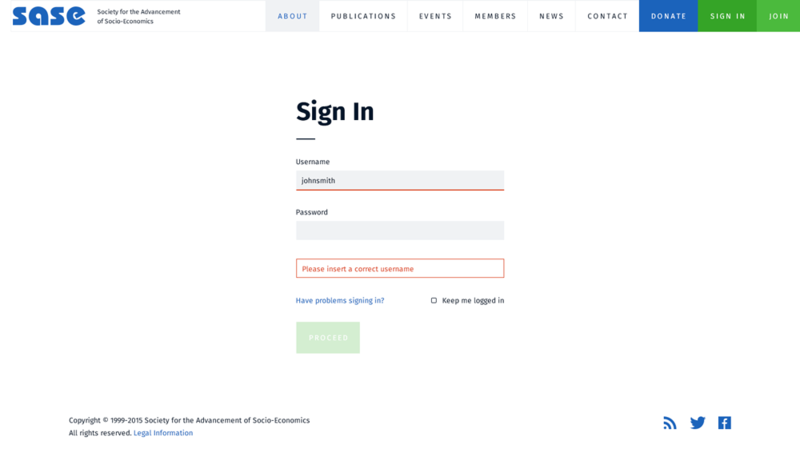 I had a few tasks to complete: make content structure easy for visitors to browse, design a way to present information distraction free, simplify membership subscription process, make content easy to update for SASE staff, and train them to use the back end. I created a simple fixed multi-level navigation panel that would disappear on scroll down and reappear on scroll up to keep the screen uncluttered while having navigation always at a fingertip, effectively reducing amount of clicks required to get to any given page to one (OK, I admit several specialized pages are harder to get to but that's by design anyway). I made the reading area of the site as clean as possible, getting rid of any embellishments that may have distracted visitors. Working with developers I was able to create the logical progression of the inner algorithm from scratch so that the previously complicated membership system with a gazillion of options and checkboxes was reduced to a couple of steps with choices. Many more problems were solved during development — ability to export in real time the huge database of members for further use in a proprietary system, synchronization of events with visitors' google calendar, automatic images optimization during content management, automation of the record keeping for the events members, and more. Overall the task of pushing outdated web resource to the new age was a success with a lot of unexpected problems and complications resolved along the way. Since even venerated professors are carrying smartphones nowadays (hint: you don't have to be old to be a professor after all) the site had to be perfectly usable on handheld devices. And so it was made to be just that. I was quite satisfied with the way this project turned out to be, and was glad to hand it over to the client's in-house team for further use.